As often the case I am plagued with many magazines, that in truth I never really read. Many of my customers think that all I do each day is dream up new ways of using different plant combinations in their containers. But the sad truth being that most of what I do in creating comes from several things. Knowing my plant material, understanding the look that is required in each container, and many years of putting containers together. The biggest mistake that many people make is not changing the soil in the container each year. Start with fresh new top-quality soil-less mix. A good quality container mix will have long fiber peat moss that will hold on to the moisture longer, but any excess water will drain away quickly, preventing a "soggy pot". Plants will respond sooner by being able to root quickly into the container. More root growth creates a larger healthier plant. There are other things that you must consider before you start your planting such as location, sun or shade, as well as to making sure that each container has a hole in the bottom, again preventing the "soggy pot". Also do you have a supply of 20-20-20 fertilizer on hand for the weekly feeding? Like children and pets all containers take time to maintain. Dead heading, fertilizing and watering all must be scheduled each week. As in the clothing industry, each year brings change. Never before has the garden centre been so full of such a variety of plants. The choice is endless and confusing. Often people stick to the same thing time and time again because of the "I don't know where to begin" syndrome. Certainly we have our plant sharks, the ones who circle around and then pounce, but in most cases people still need a little help. For great artistic effect, there are few rules, but here are one or two little pointers that can make a huge difference for ordinary people who do not know where to begin. Colour co­ordination is the key. Monochromatic combinations are classy. Fabulous foliage can be used instead of flowers. Try blending different leaf colours together. Larger containers are better than small ones when it comes to plant care and maintenance. Bigger pots allow the plants to settle in and establish themselves. Small pots tend to look over done, crowded, as if you wanted it to be bigger. 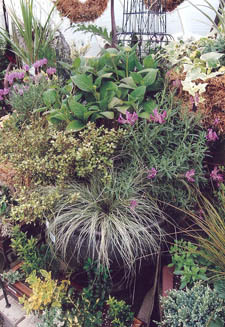 Try grouping small containers together and only planting one specimen in each of them. 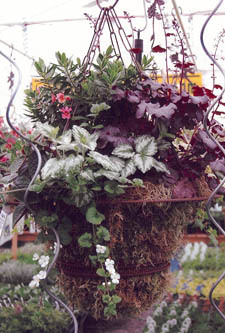 Larger containers often look better planted as a group. Arrange your pots so they look like one large container with the largest pot in the back, and two smaller ones out front. Making one large statement out of three pots instead of three individual ones. Get started early, a short growing season never allows our containers to reach "WOW" factor until well after you want them to be glorious. Be prepared to start some of your pots in April and that may mean providing temporary protection for them. This will pay off in huge dividends for making your container look great in late June early July. One of the last things to remember when creating a planter is let loose, be bold. You should not be too stiff when planting. You need good vertical lift and a lot of trailing down the side of the container. Tall narrow pots to low bowls look great by simply raising them up on pedestals. Keep in mind that all planters can be planted in a way that the season can be extended into the winter months. By using evergreens, grasses and dwarf shrubs mixed into your summer planting you will find your container looking great well after frost. Frosty Curls Grass, "Carex frosty curls" is probably the best grass for containers. Its habit cascades gracefully over the edge of the container. Its soft green colour will blend beautifully with any other colour. But the best feature of this grass is how it looks in the winter. Like an evergreen, it keeps it shape and colour no matter how much it gets squashed down by the snow. Coprosma, a large group of plants from Australia, have many varieties to choose from. Rainbow Surprise, "Coprosma rainbow surprise", is a rainbow of coloured foliage. Cream and green variegated leaves with striking pink hues turning to hot pink and red in the fall. Also try, Beatons Gold, Chocolate, and Marble Arch. All of these have glossy leaves that stand out in containers. 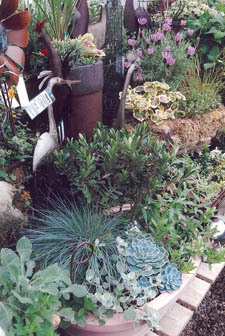 Hebes, Euonymus, and Euphorbia's are all great species that will give you great texture in any container. You have never had a wider selection of colours and textures from which to choose. Remember when making any container, be creative, and add lots of imagination and determination, and most of all have fun.